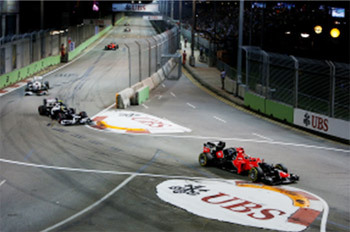 The Fédération Internationale de l’Automobile (FIA) and Singapore GP will be reconfiguring Turn 10 (Singapore Sling) ahead of the 2013 FORMULA 1 SINGTEL SINGAPORE GRAND PRIX, so that cars will now negotiate a flowing left-hander before accelerating towards the Anderson Bridge. Based on simulations conducted by the FIA, the speed of cars approaching the realigned Turn 10 can be expected to increase by up to 40km/h. As an added safety measure, an extra layer of TecPro barriers will line the end of the run-off. Some sections of the Marina Bay Street Circuit will undergo minor resurfacing as a result of use by daily traffic. 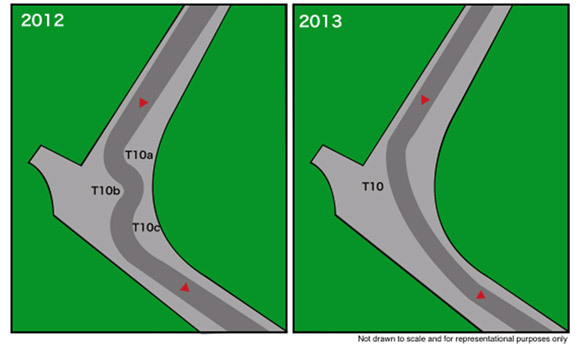 These include: the first three turns, Esplanade Drive, Turn 5 and Turn 8. The Pit Lane will also be resurfaced as some ground settlement has been observed.